Effects of dietary crude protein level on fiber production of Angora and cashmere-producing Spanish goats were studied in 16 yearling doelings (eight Spanish, eight Angora) for 8 weeks. Goats were housed in individual stalls and maintained at constant temperature (21C) with 9 h light and 15 h darkness each day. Goats were initially sheared, blocked by body weight (BW) and assigned to one of two dietary treatments (8 or 16% crude protein (CP)) in a 2 × 2 factorial design. Diets were isocaloric (2.9 Mcal kg -1 digestible energy (DE)) and were fed ad libitum. Dry matter intake (DMI) was similar for Angora and cashmere-producing Spanish goats. Daily DMI (612 vs 892 g day-1) and BW gain (38 vs 127 g day-1) were greater (P < 0.05) for cashmere-producing Spanish goats fed the 16% CP diet compared to 8% CP. For Angora goats, DMI (734 vs 832 g day-1) and BW gain (55 vs 116 g day-1) were also increased (P < 0.05) at the 16% CP level. Nitrogen retention (2.2 vs 8.7 g day-1) increased (P < 0.01) with dietary CP for both types of goats. Creatinine and packed cell volume were lower (P < 0.10, P < 0.01) for Angora goats. Both plasma urea nitrogen (PUN) and PUN/creatinine were increased (P < 0.001, P < 0.001) by high protein, whereas triiodothyronine and thyroxine were reduced (P < 0.01, P < 0.05); the clean mohair fleece weight of Angora goats was increased 31% (P < 0.05) with the high CP diet. Total fleece weight, down-yield, cashmere fiber length, and diameter were not affected (P > 0.05) by diet CP level for cashmere-producing Spanish goats. Increasing the diet CP level increased mohair production, diameter, and staple length, but had little effect on cashmere fiber production. 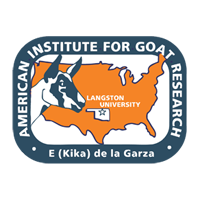 Increasing dietary protein also increased DMI, BW gain, and feed efficiency in both types of goats.